Part 2 in a series. Click here to read Part 1. We provide the safest environment possible for our students. One of the ways we do this is through gathering and monitoring risk management data. In 1999, RedCliff developed the incident review committee. This committee is responsible for reviewing each incident. As a result this allows us to create a safer environment for student and employees. Adolescents participating in wilderness therapy programs are three times less likely to visit the emergency room for an injury than kids at home. 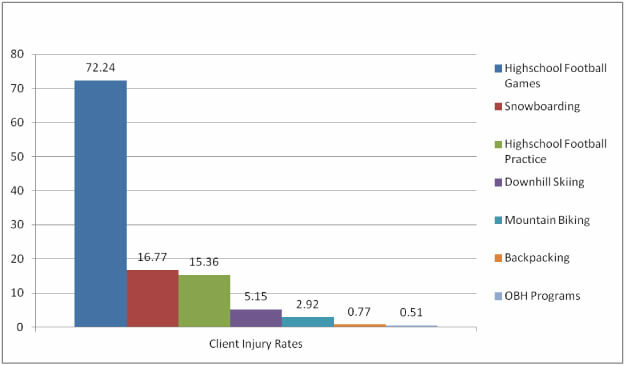 Adolescents are 140 times more likely to be injured playing in a high school football game than participating in a wilderness therapy program. Click for a link to the original article by Javorski and Gass. Continue to Part 3 of the Research Series: What About the Health of my Child While in a Wilderness Program?